Felstaff wrote: New and brilliant posts wot I dun don't appear to be showing in my post history. Lesser, more frivolous posts, such as this one, also don't appear to appear. By my reckon, that was posted at the 2:45pm. It is now midnight:38, and that post is showing as your most recent. I do not know if you have posted since then, but I'll check again in the morning. How bizarre. For me, it's showing the latest post I made being a FaiD missive on April 6th. I'd take a screenshot but it would show a post I made in the mod forum emphatically highlighting my hatred for every single person who posts on this stupid forum for jerks. I don't see any reason not to post that screenshot. This is possibly a separate issue, but I notice that frequently-logged-out syndrome when I'm linked to an address of the forum that I don't use as often. Generally I stay on forums.xkcd.com but there are a lot of links to fora.xkcd.com around. I've been noticing that I have to login on the "fora" side of things multiple times in the span of a day or two, even after checking "Remember me." This seems to be a new bug since the migration. Before the migration, the "fora" side would properly remember my login for a long time. I kind of want to know why Felstaff has about 150,000 posts in the moderator forum. Spambot Elimination Multiplier Chain. Encourages moderators to log in daily. Visits at 6000 posts too, supposedly. Interpreted it as every 6000 posts. Triggered multi-Belial at some point. 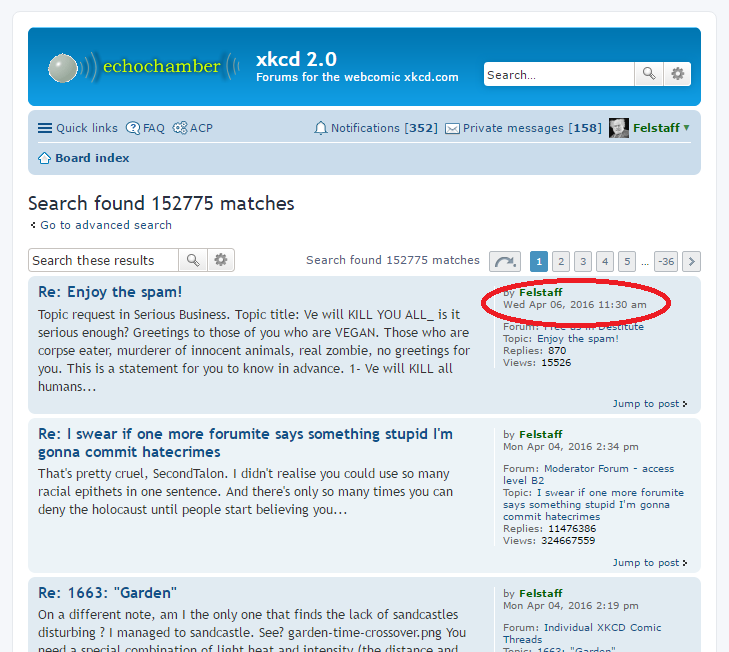 patzer wrote: I kind of want to know why Felstaff has about 150,000 posts in the moderator forum. Well, he has 11 million replies on one thread, that's gotta be hard to keep up with. Just noticed something. Goes from Page 1 to -36. Deva wrote: Just noticed something. Goes from Page 1 to -36. Now we know who keeps breaking the forums. I just got three notifications from a thread from last year (as in, the notifications were from posts made last year, that I had already seen and responded to back then). First time anything like that has ever happened. Don't know if that's relevant to the forum migration or indicative of any kind of larger problem but thought I'd flag it just in case. Pfhorrest wrote: I just got three notifications from a thread from last year (as in, the notifications were from posts made last year, that I had already seen and responded to back then). First time anything like that has ever happened. Don't know if that's relevant to the forum migration or indicative of any kind of larger problem but thought I'd flag it just in case. Were the posts recently edited? Two of them were, the third was not, though the second was edited three times in a row. Also meanwhile I got another notification from another old thread (same user as the first three though), and that one was edited. If it weren't for the one that was not edited I'd say "problem solved" but that one just makes me more confused. Was it the last post in the thread, or a moderator? Those edits don't give a notification on the post itself. Yep, that solves it. The unmarked edited post that notified me was the last post in the thread. The remember me button doesn't seem to be working for me. Sorry - I may be repeating what is already known, but I feel like once I perform a search I break it (for me). When search came back, I could see my posts again, but then posts I made after that point did not show up. On April 22, someone told me I could see more recent posts by limiting the results by a time period, and that worked so I was happy. I think I tested it with a limit of 7 days. Such a search now returns to me 9 matches between April 16 and April 22, which begins with the first post that doesn't show up for my unlimited search, and ends with the then-latest post of me asking if I should bring up my search woes on this thread - I believe that's what it gave me at the time too, leading me to believe that there was a useable workaround. I can't remember when I tried again, but I'm guessing it was the next day, and that I then tried 1-day with success, because If I limit results to the previous 1 day now, I see the 5 results from April 22-23 that begin with me asking that question and ending the next day in Garden talking about balloon strings. If I do 14 days now, I get 19 matches that end with the same post as the 7-day search does. Maybe I also did this search that same day, but I don't remember. Just now I did a 6-month search and yay! I get 135 posts, ending with my most recent one, involving poronkusema on Time. I suspect that search is now set, and I'm reluctant to try any of the others, because I'm not sure if I've given them their one use yet, and, if not, why waste 'em? I'm pretty sure 3 months is still unspoilt (at least by me). Sorry if this is all redundant. Also, sorry I don't have any awesome screengrabs like Felstaff. ETA: I just checked 6-months again, and as I thought, this post is not there. I wondered if I could fool it by changing Descending to Ascending, and that didn't work at all: it still said that there were 135 results, but it's really confused about how pages work. There should be 4 pages of results, but clicking on page #s does not give the predicted results, and I haven't been able to see the most recent page at all. The first page it showed me was the oldest stuff, but the page 3 number seemed selected. Clicking page 2 shows me what I'd expect. Clicking on 1, shows me oldest, but makes the 3 light up. Clicking on 4 also shows the oldest stuff, but none of the numbers are selected. Clicking on 3, shows the page it should, but then the 1 lights up. This means you can't switch between pages 1 and 3, because when it's showing 1, it already thinks it's showing 3. None of this matters I guess - does anyone use Ascending? - but I mention it in the hopes that it's some awesome clue to what's going on, and you'll end up having a parade for me. Last edited by ggh on Tue Apr 26, 2016 1:58 pm UTC, edited 2 times in total. The one-time thing seems to be fixed, and the time-limited searches seem to work correctly. The problem with them is you'll never know that way if someone replies to a thread you haven't posted in for a year. I'm doing it wrong then. If I want to see the last ~10 posts I wrote, how do I do that? Oh, you're talking about individual posts. The search functions most of us have been talking about relate to finding the threads you've posted in and seeing if they have new posts. Oh right. No, I've got a lousy memory, so I'm usually looking at my individual posts to see who I need to apologise to. I look at other folks' post histories all the time too, and those searches appear to be breaking too even with the time limits. Of course, if I'm the only one who uses the post searches, no worries if it doesn't get fixed. gmalivuk wrote: The one-time thing seems to be fixed, and the time-limited searches seem to work correctly. The problem with them is you'll never know that way if someone replies to a thread you haven't posted in for a year. When I adjust the parameters at the bottom of my egosearch page, it looks like 1 year is also messed up but 6 months is fine. WHen I use the advanced search options for topics you've posted in in the last year, I see the recent comic threads. gmalivuk wrote: When I adjust the parameters at the bottom of my egosearch page, it looks like 1 year is also messed up but 6 months is fine. Just now, 1 year, 6 months and 1 month don't work; 3 months appears to be up to date at present. Ubik wrote: Well now I noticed a thing with egosearch - this thread is not there, unless I change the "Display posts from previous" option to something else than "All results" from the bottom of the egosearch results. Update: Now this thread too shows in my egosearch without changing display options, so things are looking good now. My egosearch (and time-scale egosearches) also appears to be working. I'm still getting the issue of not properly jumping to the first unread post of a thread when clicking the 'first unread post' button. K-R wrote: I'm still getting the issue of not properly jumping to the first unread post of a thread when clicking the 'first unread post' button. What are you seeing instead? Are you jumping to the previous page? If so, that was an issue before the migration. Are you jumping to a point on the same page but not straight to the relevant post? It might be related to loading pictures - if any posts before the newest have pictures in them that have not been loaded, then you'd first jump to the correct location, then after loading pictures the page will "extend" downwards and you'll end up higher in the page then the original post (since it's move down), and I don't believe there's actually a way to fix that. Zohar wrote: Are you jumping to a point on the same page but not straight to the relevant post? It might be related to loading pictures - if any posts before the newest have pictures in them that have not been loaded, then you'd first jump to the correct location, then after loading pictures the page will "extend" downwards and you'll end up higher in the page then the original post (since it's move down), and I don't believe there's actually a way to fix that. This. It worked fine before the migration, as well as on every other forum I visit. It's always been a little choppy with many or slow-loading images on a page. Once it's all loaded (and thrown the view out of place), select the address bar and hit enter, and you should be back at the intended post. Yeah, it still doesn't quite seem to be working entirely. HES wrote: It's always been a little choppy with many or slow-loading images on a page. Once it's all loaded (and thrown the view out of place), select the address bar and hit enter, and you should be back at the intended post. Wouldn't that just jump to the top of the next page (or the current page, if it's the last page), because the unread posts on that page would now be read? The link for first unread post in a thread redirects you to the address of the specific post. If you refresh the page, the address will still point to the same specific post. The address also contains a fragment identifier (for example #p3969577 for your post), that is used to send the browser to a specific place within the page. When you're on the right page and the address has a fragment identifier, the default action is just to change the offset within the page to the place where the element matching the identifier is, with no page load. If you hit enter in the address bar, and the URL matches the page you're already on, and there's an anchor (ie, a # with something after it), then it doesn't actually reload the page, it just scrolls to that anchor. It needs to work that way because that's how links to anchors work to just scroll the page without reloading, and if theyre doing that they may as well make the address bar work the same way. Which means that if the address bar already has an anchor in it, and you just select it and hit enter, then it will re-scroll to that anchor, which is useful if the thing you've been linked to has been pushed off the screen by loading images or suchlike. This generally works anywhere you've been linked to a page with an anchor, and once the page loads that anchor is no longer on-screen, and you want to find it. Depending on the browser you're using, and the version, and the website, and the phase of the moon... sometimes it also works that if you click a link, and don't scroll the page, don't touch anything, while the page loads, once the page finishes loading everything, it'll go and re-scroll to the anchor for you. But if you touch anything while it's loading, it assumes you're in the middle of something (and re-scrolling once the page finishes loading would be disruptive) so it doesn't do it. And sometimes it just doesn't do it anyway, it's not the most reliable of things. But sometimes it happens. phlip wrote: Depending on the browser you're using, and the version, and the website, and the phase of the moon... sometimes it also works that if you click a link, and don't scroll the page, don't touch anything, while the page loads, once the page finishes loading everything, it'll go and re-scroll to the anchor for you. But if you touch anything while it's loading, it assumes you're in the middle of something (and re-scrolling once the page finishes loading would be disruptive) so it doesn't do it. That's how it used to work, and how it works on all other forums, except for the fact that it readjusts whether I scroll away or not, which can be really annoying if I don't notice the page hasn't quite finished loading. It hasn't happened since the migration. I'm pretty sure on some forums the anchor is actually just #unread, not a specific post, which is why I thought it might break. But obviously that wouldn't apply here, since it does anchor to a particular post.